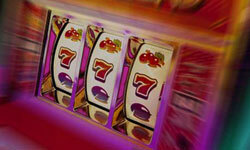 Progressive slots are considered to be the most profitable slot machines - both for the casino and for the players. Here you can read about the advantages of progressive slot machines and find out how exactly the profit is gained while playing this type of slots. And the list of top 10 online casinos will help you choose a place to try out your newly acquired knowledge. As you may know, the jackpot payouts in straight slots is fixed as inscribed in the payout table you can find on the machine's face or on the different screen of the video slot machine. Usually the jackpot is reached by making maximum bet with maximum coins. It is in fact almost the same with progressive slots, but with one basic difference: the jackpot for progressive slots is not fixed. When the player makes the bet, a certain amount of the bet is subtracted to be added to the total jackpot. This means that every given bet of the player increases the progressive jackpot, which can in time reach tremendous size. Every progressive slot machine has an indicator that displays current jackpot and the changes in its size. Another advantage concerning the progressive slots is that progressive slot machines can be banked. When the machines are banked it presupposes that there is a series of machines that are linked to each other. This means that bets on every given machine will add to the general jackpot for all banked machines. In case someone actually wins on any of the machines, he or she may get the whole jackpot for every banked machine. Progressive slots can either have a single slot machine payline, or offer multiple lines to bet on. Multiple-line progressive slots offer higher possible jackpots considering the increased number of lines the players may bet. Most of the progressive slots offer various extras like bonus games and features (using "wild" or "scatter" symbols, etc.). All the advantages of playing progressive slots stated above do not mean that they are so easy to win. In fact, progressive slots, as any of the modern slots, work using the Random Number Generator, which is a program installed in each machine's computer chip. Random Number Generator selects hundreds and thousands of random numbers that define the outcome of the spin. This means that it is just impossible to foresee the possible results for each spin. Everything here depends on luck in the first place. Besides, due to the large numbers of players involved in game process with banked progressive slots, more people are competing with each other for progressive jackpot, which reduces the chances to eventually win this jackpot. The basic recommendation on how to win at slots when you are playing on progressive machines is to make maximum bets on maximum paylines and with maximum coins. This increases the odds of winning the progressive jackpot.